We provide prompt professional service. We have the unique ability to clean on-site where they hang or take them away to be cleaned. If you are painting or renovating, we suggest letting our professionals come and remove your window treatments for cleaning and storing at no extra charge. When the work is done, we will return and rehang them at no additional charge. We clean all kinds and styles of draperies, blinds and swags. More importantly, we clean them right where they hang in your home or office. No need to remove them for cleaning. Just tell us which window treatments you want to have cleaned and our professional cleaners will remove the dust, grime and grease while taking the utmost care. And Yorkville Carpet Care guarantees results - no shrinkage, no damage with minimal or no discolouration with any of our cleaning method on upholsteries, carpets or area rugs. 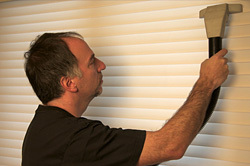 We are certified by Hunter Douglas™ to clean their blinds, shades and other window treatments. Although the your fabric blinds may not look like they need cleaning, the reality is that the material traps dust and allergens, which affect both the indoor air quality and life of your window treatments. We recommend that you don’t take them for granted. Cleaning them every two years will keep them in tip-top shape and will extend their life. *Most of the time - with the exception of horizontal blinds. If we have to remove them from your premises, we will return them within 48 hrs.